Take a Drive into Warkworth This Weekend. If you are visiting us this weekend for a workshop, why not take some time to travel ten minutes east to Warkworth for some lunch, coffee and shopping at the unique stores in our picturesque village. We are featuring a few businesses but you can read about them all if you visit the Warkworth.ca website. Driving east on #29 the first spot to visit is Frantic Farms and Cara Mia Bakery. 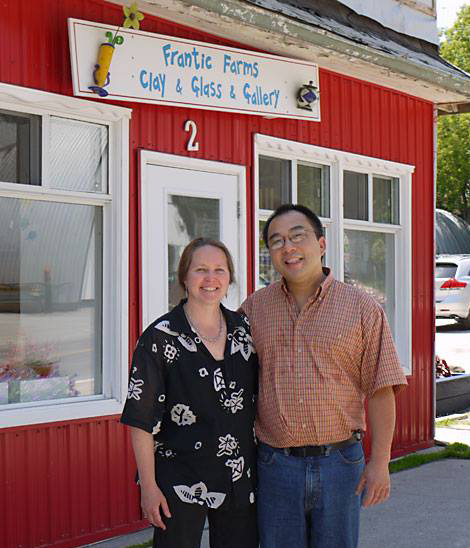 Well known local artists Monica Johnson, a potter, and Paulus Tjang, a glass blower, own both storefronts. Frantic Farms is a wonderful gallery full of one of a kind art created by both of the owners and guest artists. The bakery is full of mouth watering bread, sweet treats and frozen foods made fresh locally and if you are craving ice cream, this is the spot. On Main St. you will find several spots to eat including Our Lucky Stars Cafe and Coffee Roasters. A charming cafe and roastery serving Espresso coffees, homemade baked goods, salads and sandwiches with vegetarian options using local, natural ingredients wherever possible. Open for morning coffee and lunch every day and gourmet pizza on Saturday nights. Next door to Our Lucky Stars, don't miss Camp Ho-Ba-Chee. Lesley and Robin's fun shop is an eclectic collection of primitive to mid-mod vintage treasures you won't be able to resist. We are almost afraid to go in, we always want to buy half of the store and never come out empty handed! Tina Moorey, of On The Side Gourmet Food, is Warkworth's own celebrity chef! Her shop on the west side of Main St. is brimming full of kitchen gadgets and specialty food items including imported cheeses, pasta, jams and sauces. Be sure to check out this delightful store, there is a lot to see in this tiny space! Tina is well known for her catering business, cooking classes held across the road at On The Side Studio and new this month, the Studio is open daily for lunches. Other great spots to check out are Eclectic Mix for gifts, jewelry and art, Cheeky Bee for their world renowned candles and gifts, Trentmendous for fabulous women's fashions, Serendipitous Old Stuff for Scandinavian and French country painted furniture and Metaphorhome for stylish products for your home. Extreme Decorating, Madame Twig Style!